Christmas 1909. 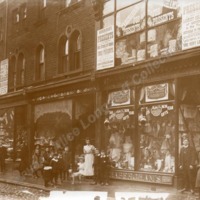 Shops: on right Haberghams Costumery, Millinery and Dressmaking advertising 'Christmas Presents' and 'New Year Gifts' and next to him Hilton Crossley. With one exception some very middle class shoppers.